The root system of a tree is seldom on the radar for forest owners and tree lovers. Roots are rarely exposed so misconceptions about how they grow and function can influence tree managers into bad decision making. You can grow a healthier tree if you understand its root system. Here are several tree root myths that may change how you perceive your tree and correct the way you plant and grow the plant. Most trees do not have tap roots after the seedling stage. They quickly produce water-seeking lateral and feeder roots. When a tree is grown in deep, well-drained soil, these trees will develop many deep roots directly surrounding the trunk. They should not be confused with what we think of as a taproot similar to other vegetable plants like carrots and turnips or the tap roots of tree seedlings. Shallow, compacted soils will eliminate deep roots altogether and you will have a feeder root mat with very few deep roots. These trees get most of their water above the water table level and are subject to damaging windthrow and severe drought. There is a belief that roots tend to stay under a tree's leaf canopy. That seldom happens. Trees in a forest have roots reaching well beyond their individual branches and leaves in search of water and nutrients. Studies have shown that roots actually grow laterally to a distance equal to the height of the tree. One report from the University of Florida extension says "Roots on trees and shrubs planted in a landscape grow to 3 times the branch spread within 2 to 3 years of planting." Trees standing together in a forest send roots beyond their individual limbs and intermingle with the roots of neighboring trees. This does happen, but it should not be assumed as a foregone conclusion. 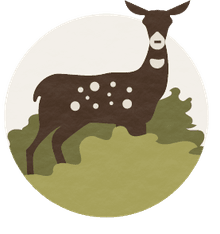 University of Florida extension says that " Roots on one side of trees such as oaks and mahogany generally supply the same side of the tree" with water and nutrients. "Dieback" of individual branches and limbs will occur on the damaged root side. Interestingly, maple trees do not seem to show injury and drop leaves on the side of root injury. Instead, branch death may occur anywhere in the crown with some tree species like maples. On the contrary, the "feeder" roots in the top 3 inches of soil supply your tree with water and food. These delicate finer roots are concentrated in that upper soil and duff layer where immediate nutrients and moisture are quickly available. 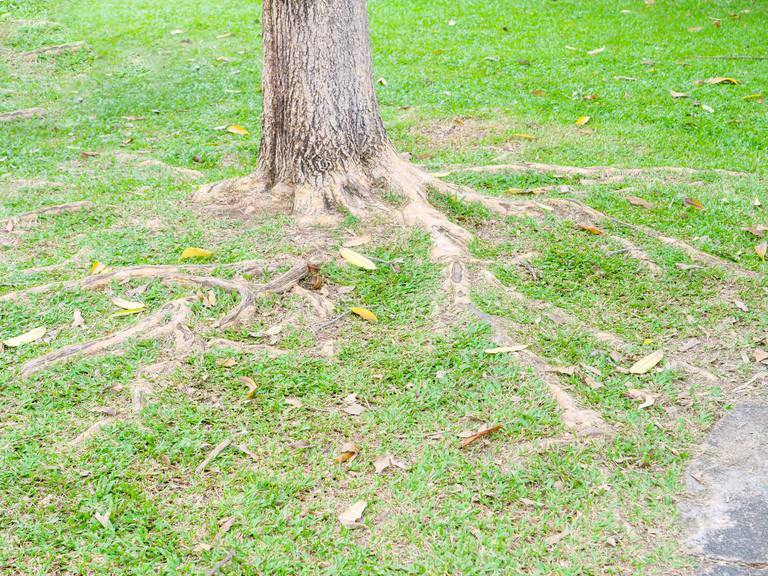 Minor soil disturbances can injure these feeder roots and remove a large portion of the absorbing roots on a tree. This is can significantly set a tree back. Major soil disturbances due to construction and severe compaction can kill a tree. When planting a tree's root ball, It is very tempting to cut back on roots that are circling the ball. It is very often thought that a dense root ball will stimulate new feeder root growth, but that is not the case. Don't worry about encircling roots as they will correct that on a new site. Most new root growth occurs at the end of existing roots. Root pruning is often done at the nursery to accommodate packaging and to resume growth before the final sale. If you are planting the tree at its final site, it may be best that you gently break up the root ball but never prune root tips. Gilman, Edward. "Dispelling Misperceptions About Trees." University of Florida Institute of Food and Agricultural Sciences Extension, Aug. 2011.